All inclusive invitations feature all your wedding stationery needs in a beautifully folded piece. The front panel is customizable and the back panel has decorative boxes that can be filled with guest information such as hotel location and registry information. 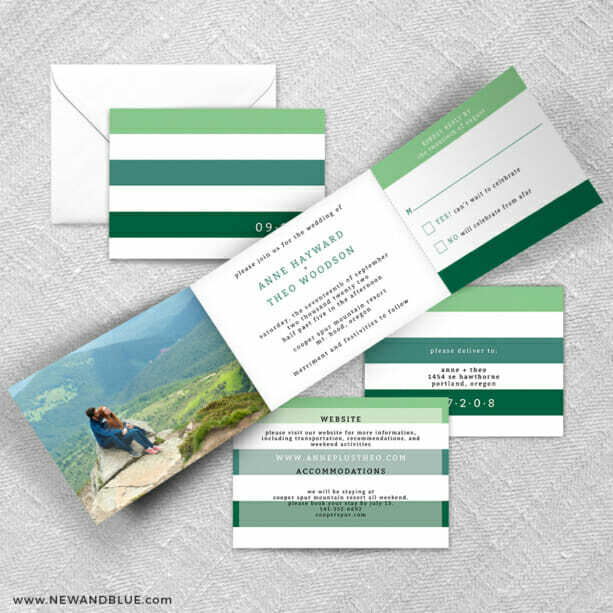 Inside you’ll find the main invitation along with an RSVP postcard that can be easily removed along a perforated line and dropped in the mail by your guests. Click the “Customize Design” button below to edit this design. Please note that we are unable to save this design to your user account. Customized designs are only saved for 2 weeks and will be purged if the item has not been updated or purchased. Time shown in business days. Delivery estimate is not guaranteed.